Italian for “have a good weekend” is to say “buon fine settimana” but, because Italians have adopted some American words and expressions, it is just as common to hear Italians say “buon weekend.” And my first weekend back in Italy was definitely a buon weekend, filled with activities and that special charm that is Lucca. 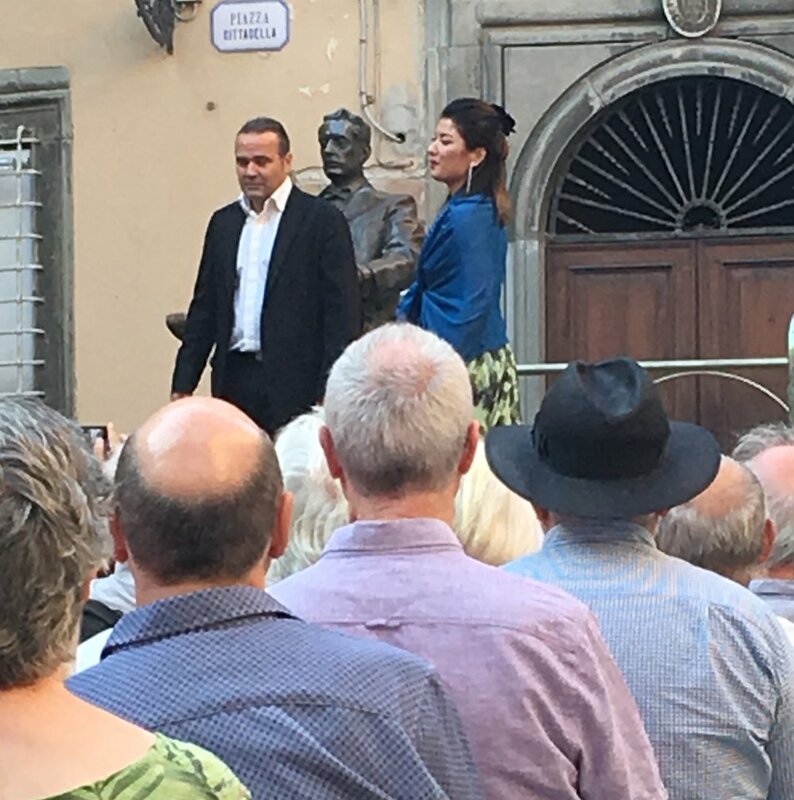 Friday evening’s highlight was a performance of arias from Puccini’s “Madame Butterfly.” No ordinary performance this - it look place outside in Piazza Cittadella, the piazza graced with a famous statue of “il maestro” himself and where the Puccini birthplace and museum are located. Ticket holders for the concert had reserved seats, but my friends and I watched from a cafe/bar along the edge of the performance area. Sipping a spritz and listening to the elegant voices while sitting outdoors in an ancient piazza was a perfect start to my first weekend in Lucca. Saturday was a busy day that began with the fall garden show Murabilia, an annual event that takes place on, and under, the southeast portion of the wall surrounding the “centro storico” (old city center) of Lucca and in the lovely botanic garden (the Orto Botanico) at the base of the wall. This exhibition of flowers, fruits, vegetables, trees, and garden design included a special focus on Japanese gardens. There were lectures (given in stone-walled rooms underneath the walls that surround the city), exhibits of seed preservation (my favorite was by the group called Seed Vicious), and of course a plant sale (oh the variety of chrysanthemums). Exhibits included a Japanese moss garden, an impressive display of vegetable and fruit varieties, and giardini aquatici (water gardens, complete with tiny fish). There were also craft demonstrations. including several basket makers, broom makers, woodworkers, terra cotta potters, and hat makers, along with artists selling beautiful prints, ceramics, and a host of artistic pieces. This was an enticing way to spend a morning, on and under the shady tree-lined walls, surrounded by colorful flowers, serene gardens, the architecture of the walls, and Lucchese families with children and dogs, all enjoying a perfect late summer day. Dogs are welcome everywhere here! Saturday afternoon revolved around a very special event - a national competition of balestrieri that just happened to be in Lucca this year. The teams, which came from various cities throughout Italy, were dressed in Medieval garb. There were banners, drummers, flag throwers, beautifully costumed women, and, of course, men with crossbows. Quite a pageant! These Medieval events are a particular favorite of mine and I was delighted to have this one, which continued on Sunday, on my first weekend here.